I’ve done very little to this snap other than add a background and fix a dread that was sticking through my torso; I want you to bear that in mind BECAUSE I want you to click on the picture, zoom in and take into account the absolutely awesome textures that are at play in this snap. The two main elements, the skin and the top/cardigan combo are from two of my favourite designers on the grid, SHANTIA SOULSTAR and RUCY BYRON, the names behind the brands ZOUL CREATIONS and APHORISM respectively. First of all now that SKIN FAIR 2015 has finished I’m surprised to be reviewing a new skin release so soon, but this is ZOUL CREATIONS we’re talking about after all and if you recall Shantia is all about releasing quality skins to the masses at cracking prices. The skin that I am sporting is called ‘Tara’ and she’s a beauty. I’m wearing her in the palest skin tone (01) because it’s my favourite to wear when sporting a Shantia Soulstar creation, it’s on the pale side but with a real warmth to it. The tone is always utterly fab on Shantia’s skins, I never have any complaints. The visage is beautiful and really benefits from the fabulous brow that Shantia has added to this line, which totally rocks the heavy brow look but offers a little less hard definition than your standard full-on Kardashian brow. The eye make-ups are corking as always, there are plenty to choose from and Shantia offers a choice of three intensities for each style, which means you can be as subtle or as dramatic as you dare. The thing I like about Shantia and her skins is that she offers so much for your Linden, and her skins are genuinely top-notch. I’m not just saying that; I really believe that we have someone here who offers a hell of a lot to the skin genre and for that should be applauded and celebrated. Like NAR MATTARU skins ZOUL CREATIONS prove that you don’t always have to follow the big brands in-world. Not that there’s anything wrong with that as I’ve said many times on these pages, but gosh isn’t it grand to have alternatives? Shantia has just released a FREE Maitreya body applier in-store. Let me read that to you again, FREE APPLIER. I cannot stress enough how awesome that is! (Look I don’t mind paying for appliers if and when I need them but the fact that a designer is kind enough to let you have them for free is pretty bloody fantastic.) ALSO do NOT miss the APRIL 2015 group gift. 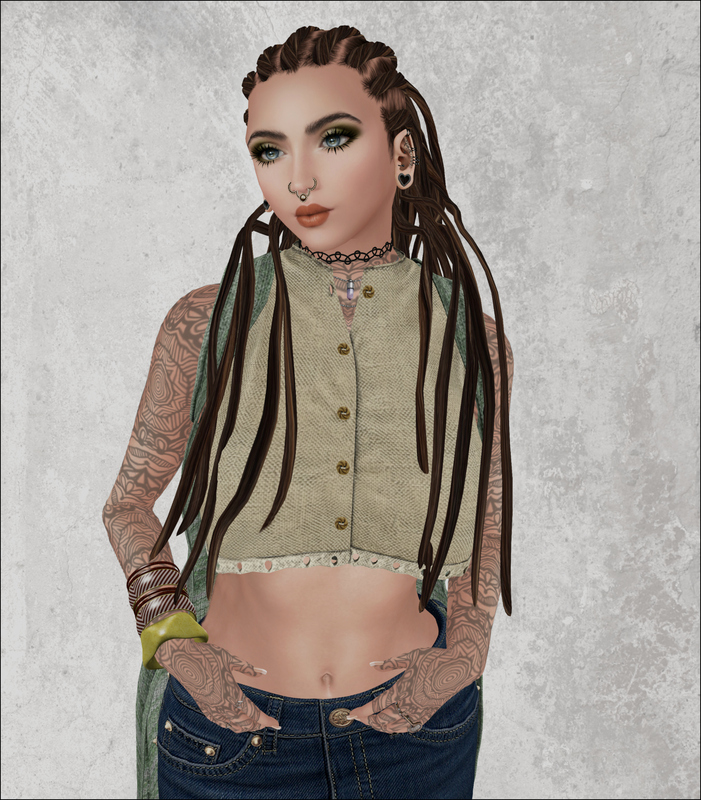 This will give you the perfect feel for Shantia’s skins if you have never worn them before, and bear in mind that appliers are free, and it’s free to join the group as well, making this freebie a positively unmissable treat. ‘Tara’ is available at THE MAKEOVER ROOM where you’ll find the skin on sale for just L$299 (two tones in each pack). Eyeshadows are available with a pack of ten styles (in three degrees of intensity) each L$75 FOR THE LOT. Lipsticks also come as a pack of ten and cost L$75 for the complete pack as well. 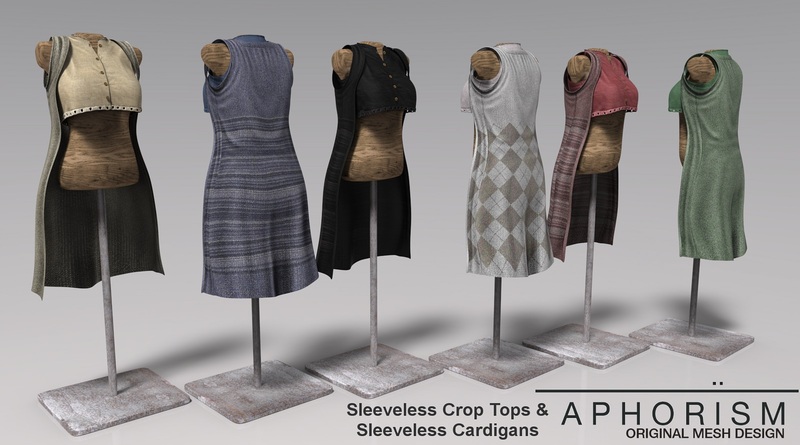 Appliers for the following are available FOR FREE at the Mainstore (remodelled and looking lovely too!) Slink (physique and hands/feet), Maitreya, Omega, Lolas,Linc Azz, Wowmeh and Evebody. Amazing! Moving on to my outfit: I’m wearing APHORISM’s latest release for THE SEASONS STORY. It’s such a treat, yet again something I would happily wear in real life! This is a rather lovely longline cardigan and sleeveless crop-top that fits like a dream, as do all of RUCY BYRON’s mesh endeavours. The shape of the longline cardigan is very authentic; sleeveless and loose with the top sitting snugly underneath. You can of course mix and match them or wear them separately with other items, something that I’m sure I’ll be trying over forthcoming blogposts. Aphorism items are always a real joy to wear and it’s a credit to Rucy’s imagination that he comes up with some amazing collections time and time again. Check out his epic Facebook page too! Some cracking stuff on display here peeps. To complete my look I added dreads and bangles and some of my favourite LIVALLE (L. WARWICK) shoes to make a boho-look that’s definitely not too shabby. In fact, I think I look blinking awesome. List of all vendors below, happy shopping!